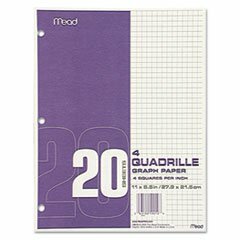 ** Quadrille Graph Paper, Quadrille (4 sq/in), 8 1/2 x 11, White, 12 Pads/Pack by 5COU at KBFS. Hurry! Limited time offer. Offer valid only while supplies last. ** Ideal for math, art, charting and home renovation projects. Each sheet is three-hole punched for use with three-ring binders. Paper is side-bound. ** Ideal for math, art, charting and home renovation projects. Each sheet is three-hole punched for use with three-ring binders. Paper is side-bound. Size: 8 1/2 x 11; Paper Color(s): White; Paper Weight: 20 lb. If you have any questions about this product by 5COU, contact us by completing and submitting the form below. If you are looking for a specif part number, please include it with your message.